s historians, we begin with a little history. The first web pages emerged in that faraway era of the early 1990s. Email and the Internet were already becoming well known, but the web, which like email uses the Internet’s global computer network to share information in commonly agreed-upon ways, had its start among physicists only in 1991. It moved into the mainstream in 1993 when the National Center for Supercomputing Applications (NCSA) at the University of Illinois released Mosaic, an easy-to-use graphical web browser that ran on most standard computers. Between mid-1993 and mid-1995, the number of web servers—the computers that house websites—jumped from 130 to 22,000. Figure 3: George Welling of the University of Groningen (Netherlands) created one of the earliest history websites in 1994. Here is how it looked in February 1999. 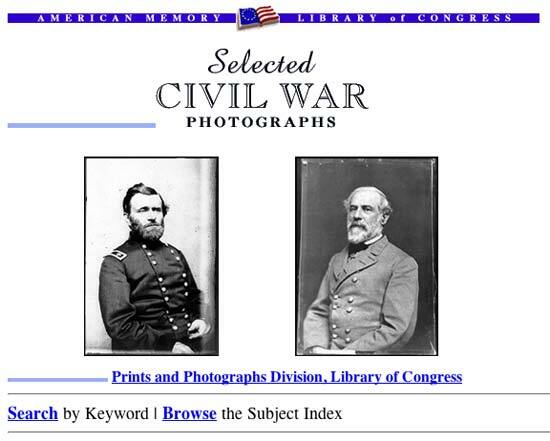 Figure 4: The Library of Congress’s first web-based collection was Selected Civil War Photographs. Around the time that these early settlers carved out primitive digital history homesteads, the first signs emerged that this new frontier might feature more than noncommercial exchange of documents and information. In October 1994, Marc Andreessen and some of his colleagues who had developed Mosaic at the government-funded NCSA released the first version of a commercially funded browser they called Netscape. Within months, Mosaic was, as they say, history, and Netscape was king of the World Wide Web. The Netscape era (from 1995 to 1998, after which Microsoft’s Internet Explorer browser began to displace Netscape) saw the History Web come into its own.4 In mid-1995, when one of us co-wrote the first published guide to the web for historians in the American Historical Association’s (AHA) Perspectives, it announced, “the explosion in Web sites has brought with it an explosion in materials relevant to historians.”5 Earlier that year, the Center for History and New Media (CHNM) had helped the venerable AHA launch its website; by that summer, forty-five history departments had posted home pages. Since the mid-1990s, the History Web has spun its threads with astonishing speed. We thought that we would impress readers in 1995 by telling them that a search on “FDR” brought up forty-nine “hits” in a commonly used search engine. In 2005, the same search yields 950,000 hits. In the fall of 1996, we did some additional history searches with what we thought were even more remarkable results—200 hits for the Civil War General George B. McClellan and 300 for the Socialist Eugene V. Debs. Eight years later, those same searches would overwhelm the web researcher with 97,000 and 18,000 hits, respectively. Even by 1996, the “walking city” that was the History Web a year earlier had become a sprawling megalopolis that no one person could fully explore. Yahoo counted 873 U.S. history websites in an incomplete census that fall. But seven years later, an even less complete tally returned almost ten times as many American history websites. These results reveal a deep and wide fascination with history among the web-browsing public. 1 Morris A. 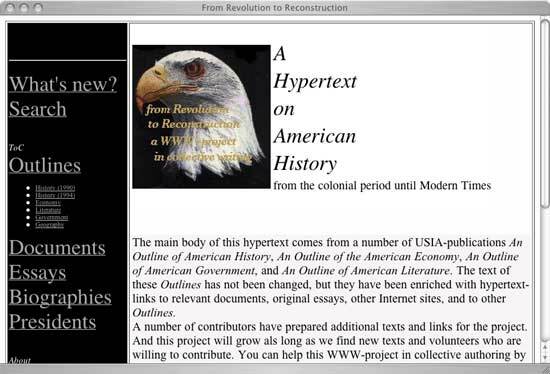 Pierce, email to Roy Rosenzweig, 23 June 2003; George Welling, “Information: About the Project,” From Revolution to Reconstruction, ↪link 1.1; George Welling, email to Roy Rosenzweig, 22 June 2003. 2 Donald J. Mabry, “History of the HTA,” Historical Text Archive, ↪link 1.2a; Lynn Nelson, “Before the Web: The Early Development of History On-line,” La Societa Italiana per lo Studio della Storia Contemporanea (SISSCO), 19 May 2000, ↪link 1.2b; Lynn Nelson, “Gods, Heroes, & Legends: Lynn Nelson in His Own Words,” Gods, Heroes, & Legends, ↪link 1.2c; Lynn Nelson, “HNSOURCE now open for business,” email to Medieval History Listserv, 20 March 1993, ↪link 1.2d; About the WWW-VL: United States History Network, ↪link 1.2e; Lynn Nelson, “Carrie: A Full-Text Online Library,” ASSOCIATE: The Electronic Library Support Staff Journal, ↪link 1.2f; Lynn Nelson, email to Joan Fragaszy, 18 August 2003; Joni Makivirta, email to Roy Rosenzweig, 21 March 2004. See also Donald Mabry, “Electronic Mail and Historians,” Perspectives (February 1991), 1, 4, 6. 3 National Digital Library Program, “A Periodic Report from the National Digital Library Program,” Library of Congress, October 1995, ↪link 1.3a; Marilyn Parr, “American Memory—Then and Now” (paper presented at the Organization of American Historians Annual Meeting, Memphis, 4 April 2003). Our own involvement in digital history started with the “new media” of CD-ROM. One of us (Roy) began in 1990 to work with colleagues at the American Social History Project (especially Steve Brier and Josh Brown) and the Voyager Company on a CD-ROM history of the United States, Who Built America? which appeared in 1993. On CD-ROMs, see Roy Rosenzweig, “So, What’s Next for Clio? CD-ROM and Historians,” Journal of American History 81 (March 1995), ↪link 1.3b. ↪link 1.4a; “Netscape Through the Ages,” Wired News (23 November 1998), ↪link 1.4b. 5 Andrew McMichael, Michael O’Malley, and Roy Rosenzweig, “Historians and the Web: A Guide,” Perspectives (January 1996), 11–16. 6 Michael O’Malley and Roy Rosenzweig, “Brave New World or Blind Alley? American History on the World Wide Web,” Journal of American History 84 (June 1997), ↪link 1.6a; Larry Stevens, Ohio in the Civil War, ↪link 1.6b; “Nicolas Pioch,” WebMuseum, ↪link 1.6c; “Introduction,” Marxists Internet Archive, ↪link 1.6d; Brian Basgen, email to Joan Fragaszy, 8 August 2003; “Constitution Society Home Page,” Constitution Society, ↪link 1.6e.